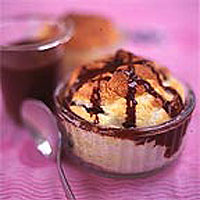 Serve the chocolate sauce separately, so that each guest can break into their soufflé and pour in their sauce. You only need a little because the soufflés have quite a delicate flavour. The sauce can be made in advance and stored in the fridge for up to 3 days. Reheat gently. To make the sauce, melt the chocolate in a small bowl over a pan of freshly boiled water. Meanwhile, put the milk, cream and sugar in a saucepan and stir over a low heat until the sugar has dissolved. Once the chocolate has melted, bring the milk mix to the boil and whisk the melted chocolate into it. Remove from the heat and gradually beat in the butter until the sauce is smooth and glossy. Cool, or keep warm if you are making the soufflés straightaway. Peel and core 3 of the pears, then weigh their flesh. You should have about 400g. Roughly dice this and place in a non-corrodible saucepan with half the lemon juice and 85g of the sugar. Cook gently for about 15 minutes or until the pear is soft and surrounded by juice. Purée in a blender and return to the pan. Meanwhile, mix the arrowroot with 50ml Calvados and stir into the puréed fruit. Reheat and boil for 2 minutes until the mixture thickens. Remove and cool. Preheat your oven to 220°C/gas mark 7. Brush eight 150ml soufflé dishes with the melted butter and liberally coat with caster sugar to help the soufflés to rise. Set aside. Prepare the soufflé filling by peeling, coring and finely dicing the remaining pear. Mix with 1 tbsp Calvados and the remaining lemon juice and leave to macerate while the purée is cooling. Once the purée is tepid, strain the macerated diced pear and mix the juices into the purée. Whisk the egg whites until fluffy, add the remaining 30g of caster sugar and continue to whisk until stiff. Loosen the puréed pears with one third of the whipped whites and then gently fold in the remainder. Spoon the mixture half way up the soufflé dishes, sprinkle with the diced pear, and top with the remaining soufflé mixture. Flatten the top of the soufflés with a palette knife, then run your thumb around the top inside edge of the soufflé dish to prevent the soufflé sticking as it cooks, which can stop it rising. Place on the hot baking sheet in the centre of the oven and immediately lower the temperature to 190°C/gas mark 5. Bake for 10 minutes until they are well-risen but slightly wobbly. Serve immediately with the hot sauce.